ZIGVIEW - the worlds first ever Digital Angle Finder, makes low and high level photography easy with its unique rotating LCD monitor. 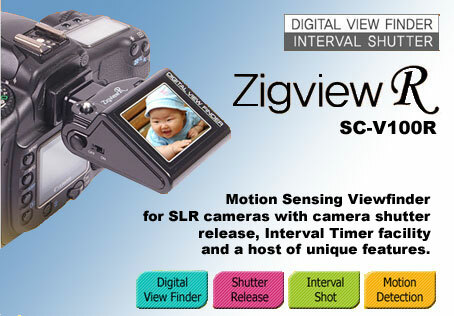 ZIGVIEW simply attaches to the eyepiece of your SLR camera where the viewfinder image is captured by a CMOS sensor built into the Zigview and relayed in real time to a 1.9inch TFT colour display for easy viewing at any angle. Please note that the Zigview is the normal color - NOT IR - product. We may make an IR version of the Zigview if we get enough requests. Especially useful for low angle photography where you would struggle to see through the viewfinder especially with macro work or high angle situations such as press work. An optional screenshade is available designed for positioning over the LCD screen which successfully shades the screen from any glare, be it from the sun or artificial lighting, ensuring a clear view of the subject and an accurate preview of the picture. Incorporating self-supporting technology, the hood can be manipulated to whichever position is required and will stay rigidly in place. 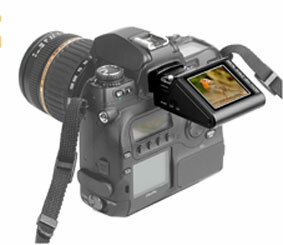 It is also available with a built-in magnifier, giving the photographer a more detailed view of images. Interface Ports for battery charging of internal battery, manual shutter release and shutter connection port. With your camera set on "bulb" you can set the Zigview-R to expose the subject for a specified bulb duration within the interval timing facility. Interval timing can be performed with simple settings using number of shots required and the interval between shots, or more details can be specified.